Geoff: Welcome back, everyone, to another edition of WTI. Craig: It feels good to be back... Which, I suppose, could be a larger metaphor. Geoff: So the Minnesota game was kind of weird. We went down 10-0 and then rattled off 34 unanswered points. Craig: Yes, it was very strange, but in a way, completely expected. Craig: Two Michigan games have been absolutely textbook this year: Purdue and Notre Dame. Even if Joe Tiller wrote "Tiller RULEZ" into said textbook with Sharpie late in the game. Geoff: No, Joe Tiller's book says "DIABETUS". Geoff: Ryan Mallett rained death and destruction on the Gopher secondary, Mario Manningham had a circus catch, Arrington did that thing where he lays out like the second coming of Anthony Carter, and Carlos Brown busted what has to be the longest run from scrimmage Michigan's had in 4 years. Craig: Carlos' run was, well, electric. Like the thing at midfield at halftime: We don't know where that came from, and we're not sure what it was doing there, but we made noise for it nevertheless. Geoff: That thing was weird. I assumed it was some sort of sound-level thing, but still. Craig: But the Minnesota game, while perhaps mildly more dramatic than needed, is another case of the scoreboard lying. Geoff: It was full of lies, damn lies, and statistics? Craig: Yes. And one of those lies is that anyone can see Milano let alone tackle him. I swear, we can play 12 on the field if he's out there, the back judge will never spot him. Craig: Michigan covered, but it gave up 10 points, but it really only gave up three when you look at it. Geoff: It was really weird. And the score was even closer throughout much of the game. Craig: The Cake was tremendous, and moist, which, while usually a good thing for cake, was not necessarily good for The Cake. Geoff: The Cake on FieldTurf >>>>> The Cake on muddy turf. Geoff: Note for those of you playing along at home: By the year 2017, the music now known as the blues will exist only in the classical record department of your local public library and our blues band is led by "Scottie B". Craig: You know, I can remember when the blues would only be in the local public library by 2006. Geoff: Yeah. I was excited to be in the stadium when Carl had to change his script. He bumped it up to 2010 last year. Craig: Indeed. He's buying time! Craig: But Saturday was all kinds of a crazy double. Geoff: Right. You headed over to Yost for that hockey game against BU. Craig: Which, in all of my years, I had never done a double, in part because they try to avoid the double. Geoff: I've done that before. Definitely after the Iowa game in '04. Craig: But let me tell you, Yost was ROCKING on Saturday. Best crowd in years. Geoff: I love it when it gets like that. I was there for the BC game a couple years ago, and that was tremendous. Craig: Granted, the winning and the post-football buzz and the costumes may have had something to do with it, but it was just fun. And having really gotten my first good long look at this year's team, I find myself...encouraged? Geoff: I'm jealous you got to see a band director dance. Craig: Well, it's what happens when you hire mercenaries. And he danced with vigor AND gusto. Geoff: I feel a lot better now about keeping up the streak of NCAA appearances. Craig: As do I. It's a young season, a lot of teams are still finding themselves, a lot of teams will improve, but I also think Michigan, while having room to improve, is already playing like a team. And, by Jove!, they shoot! For the love of criminy, they shoot. Craig: Which removes one of my single biggest frustrations of recent years, a team that seemed to be looking for the perfect shot. Geoff: I think we need to see more of what Sauer looks like this season, but it's nice to know the cupboard isn't exactly bare on the other end of the ice. Craig: Yes, I am worried that Sauer will be live up to his nickname of "Sweet and". But if he keeps playing like this, again, he's doing what he needs to do to make sure that Michigan is in the game. Craig: Tough tests loom. Miami, Notre Dame, Michigan State, and Ohio State, no slouches in that bunch, a lot of tough conference games. But I think this team is going to be a lot of fun to watch. Geoff: Yeah, the CCHA has some real programs to watch out for. Craig: And, a note to the student section: Keep up the good work. Saturday night is great proof that you can be clever, loud and proud without being profane. It was a great balance of clever and classy. Craig: Then again, Yip Yip Yip Yip Yip Yip Yip Yip Yip Yip Yip Yip Yip Yip Yip Yip may not be able to be replicated again ever. Geoff: That's just taking what the other side gives you. Craig: Not since Colgate's Whitecotton or the Dirty Hobbit of Lerg was there such relentless torment of a single opposing player. Geoff: I'm so proud that I was part of the first Dirty Hobbit game. Craig: It's Michigan State week ladies and gentlemen! Craig: I am sure your Sparty colleagues and co-workers have already been puffing the chest a little bit this week, mentioning the Horror and the Beatdown with glee at every opportunity, and trying to use the word "Ringer" like it's Ni! Geoff: I will, by the way, be taking in the game firsthand. Craig: Oh, wonderful, meaning that you will have a Big Ten of games this season. Geoff: Yep. And this is my first Michigan/MSU road game since...2001. Geoff: Kickoff is six years to the *minute* from that travashamockery in 2001. Craig: Gentlemen, the clock is ticking and as of now, we are keeping score. Geoff: The Spartans tried to set theirs going, but it got stuck at 00:01. Craig: You know, if Michael Hart is rested and ready to go, I'd love to see him decide he's going to win the Heisman this week. Geoff: He's been studying film of Chris Perry from 2003, thinking "I can do that." Craig: One can only hope. And then someone slipped Donovan Warren the 1997 game film. Geoff: Our guys are going to be ready to go, I know it. I just hope that our linebackers are up to the task of taking down Ringer and Caulcrick before they get up to speed. Craig: Well, State abandoned the Communist offense and Michigan knows how to defeat straight up facism! Geoff: I don't know what to expect from the offense anymore. But I do know that Michigan State will give up some points. 34 to Iowa? Craig: I expect Henne to be on target and focused. I think, maybe secretly, he loved the praise for the effort against Illinois and he wants to hold on to that feeling, and his focus will be at an exceptionally high level. Beating Michigan State four straight, bookending his first victory against the Spartans with another great day would be a wonderful feather for him. Geoff: I expect the line to pass-block like he's made of antique porcelain. Craig: And if Hart's back, that's one more exceptional pass blocker. I wish someone would put together a Jaworski-like breakdown of Mike Hart's exceptional pass blocking. Geoff: I was re-watching the Purdue game last night and he had some terrific ones to keep Henne clean. Craig: Also, you know DeBord has some pages in the playbook that are in mint green just for this occasion. Craig: The reality is, and Michigan fans know this all too well, anything can happen upon the banks of the Red Cedar, games are closer than they should be and when Sparty has made this their Thermopylae, they will likely be well motivated. What the Spartans forget is that all but one of the 300 died at Thermopylae. Geoff: SPARTANS! TONIGHT...WE DINE...IN BRODY! Craig: Bravery and heroism are wonderful things, but, to go back to another Patton reference. "The Spartans are the enemy. Wade into them. Spill their blood. Shoot them in the belly!" Geoff: Ol' Blood and Guts is a fine way to end this one, I think. Geoff: And I'm keeping a low profile until I get out of there alive. Craig: That's a good plan, Guy Incognito. "Probably the thing I hate most about them is that damn fight song. I'm so sick of hearing that fight song. Every time that fight song comes on, I'll mute my TV. It's one of those things that's just annoying. I can't stand it." That makes 31 times Michigan scored a touchdown or field goal during his tenure. And actually, the band plays the Victors trio twice after a score (once during the PAT), so double the count for every touchdown. That accounts for 55 Victors trios off scoring alone. While marching off the field at halftime. This adds up to 29. Counting postgame shows adds 6 more iterations. During Drew Stanton's tremendous 0-5 career against the University of Puke, he heard The Victors a bare minimum of 90 times. This bare-minimum estimate does not count playing it after recovering a fumble, nor playing the slightly-extended version to rally the team (which wasn't often necessary), nor "alternative" versions of The Victors like Calyptors, the Hoover Street Rag, or the Victors Waltz. An extremely conservative estimate of three additional performances per game puts that number well into the triple digits. I made a video in honor of his 2005 failed victory guarantee; Drew Stanton has clearly been a ripe source of material for many years. Braylon Edwards just keeps climbing up the list of my favorite Michigan football alumni. So far this year he's donated $500,000 to the athletic department for football scholarships and $1,000,000 to Cleveland students for academic scholarships. Last weekend, he dedicated his eight-catch, two touchdown performance to the memory of Denzel Douglas, a 15-year-old kid he met while visiting him in the hospital. Douglas died last week as a result of his body rejecting his heart transplant. He'll be buried in the jersey and with the football Braylon signed for him. Between his and Mike Hart's charity work, I'm so proud to be even remotely associated with this program. They're true Michigan Men. Michigan's first important rivalry game of the season (sorry ND and Illinois) is this weekend in East Lansing, and HSR would like to educate you about Michigan's upcoming opponent. Michigan Agricultural College was founded in 1855 by the U.S. government to promote the advancement of cow grazing, manure farming, and rioting. Sometime between now and then, the Aggies set up goalposts on a cow pasture, and football was born. The school fight song was penned to pay homage to their Fighting Farmers of the gridiron. An excerpt went like this, and we are not making this up: "Its specialty is farming, but those farmers play football." Six-touchdown blowouts two days before the coach is fired, followed by press conferences where the reporter asks "do you still have control of your team?" And he responds with "I don't know." Here's hoping we can add more to this list next week. Go Blue! I don't know if everything's better, I don't know if Ryan Mallett will be brilliant or not, but Michigan won a game that it needed to win, without two key starters on offense, and heads into November on a roll. They're going to need it. The defense does look much improved. It still seems bend, but not break, but as long as there is no break, that can work. Again, the next three weeks will bear it out. You know folks, if you had told me that Michigan would be heading into November as the #12 team in the BCS poll and with two losses, I would have believed you. If you had told me one of those losses would be to Oregon, I would have believed you. But, no, this is just crazy talk now. Frankenberry and a Penguin were in the House. So were three refs, a guy in a tux, and a yacht rocker. Halloween was never a big deal when I was in college. The Howell High School band filled in admirably for the Michigan Hockey Pep band last night, and got a well deserved "Best Band Ever" from the crowd. BU's Kevin Yip had an entire crowd yelling "Yip Yip Yip" at him in a high pitched voice at him every time he got near the puck. It was like how Shelbyvillians hoot at Springfielders. I loved it. When they announced the World Series score with the Red Sox leading, prompting cheers from the BU fans, the Michigan student section started yelling "Let's go Rockies!" When the game was in hand, the student section began chanting, instead of "Warm up the bus", "Go start the cah" and "We want chowdah"
It was the most fun I have had at Yost in a long time. If you're a member of the Yost student section, know that it's that kind of clever that people can enjoy and admire from a fan base. It was ten years ago, but it seems like yesterday. It was ten years ago, but it seems like a lifetime ago. It was October 25, 1997 a chilly day in East Lansing to be certain and #5 Michigan had headed north to face the #15 ranked Michigan State Spartans, a team which had just suffered a two point setback to Northwestern at Ryan Field the week before, but at that time still the Spartans best start since 1966. Michigan was coming off its closest win of the year, a four point victory over Iowa at the Big House that was far less in the realm of joy, and far more in the realm of relief for Michigan football fans (sound familiar?). The season had not yet become magical, but there was something special in the air, as it was the first time Michigan had started the season with six straight wins in 11 years. Spartan quarterback Todd Schultz entered the game with a 61.5% completion percentage and 10 TDs to just four picks, while Michigan's defense had allowed a grand total of nine second half points, thanks largely to one man, Charles Woodson. Five tackles and two interceptions later, a football player ceased to be and a legend was born in his stead, largely because, while the second of Woodson's interceptions showed his skill in pass coverage, the first of Woodson's picks seemed to defy physics, gravity, and common sense. An elegant ballet of a powerful leap, body positioning, and steady hands, Woodson pulled down a pick (caused, in no small part, by great pressure on the quarterback during a roll out) that should not be, lands, keeps possession of the ball near the Michigan State sideline, and gets up to play the "Who's the man?" game. That one moment shows the awesome power of Charles Woodson, but it does not explain why he is the most important Michigan player of the last 50 years. Woodson played in all three phases of the game, on the field for a remarkable 765 plays during the 1997 regular season, 152 of those coming on offense or special teams. During 1997 alone, he had seven interceptions, and while he did not make any of them a pick six, he did his damage on that front on special teams with his punt return against the Buckeyes in the season closer at Michigan Stadium. He also killed Ohio State's first drive of the second half with a pick in the end zone. In the biggest games, when Michigan needed him the most, Woodson seemed to find a way to shine. All of this from a man who was likely being game planned away from and generally thrown away from after being an All-American his Sophomore year. Of the 15 times Woodson touched the ball on offense in 1997, Michigan scored three touchdowns and picked up nine first downs. The overall point here is one often overlooked as much in the national argument about Woodson's Heisman as it is by Michigan fans looking at Woodson's importance in the grand scheme. Woodson's presence (not his mere presence, mind you, that's different), changed the game in so many ways. Opposing offenses had to plan on throwing away from his side of the field, allowing Michigan to bring the fury up front with guys like Sword, Hall, Steele, and Dhani Jones. Similarly, Woodson brought out the best in Marcus Ray (a player whom I always really liked because he just HIT people), because defenses attacked him with greater frequency. On offense, Woodson was a wild card, you had to account for him, even if he was just in as a decoy. On special teams, his punt return average was not spectacular, but the belief that he could break one made teams leery of kicking towards him. Charles Woodson made his team better, not only because of what he could do on the football field, but because of what teams thought he could do on the football field. Players like that come along once in a generation, and we were fortunate to have seen one of them come through Ann Arbor. "Ron Zook doesn't fish. He merely recruits fish into the boat." Geoff: "Ron Zook once sold an icemaker to an emperor penguin." Craig: "Ron Zook out text messaged Beth Ann from the Cingular commercial. Her BFF Jill was deeply impressed by the Zooker and will be lining up at long snapper for the Illini next season." Geoff: "Ron Zook isn't allowed in convents...anymore." Craig: "Ron Zook originated the Jedi Mind Trick." Geoff: "Ron Zook is the foremost pork wholesaler in Jerusalem." Craig: "The Pentagon's secret plan for meeting U.S. Army recruiting quotas this year revolved heavily around Ron Zook." Geoff: ""Ron Zook made $16M last year in consulting fees with Madison Ave. His skill is marketing, but college football? That's his passion."" Craig: "Some Jehovah's Witnesses came to Ron Zook's door one day. They're now on the Illini Scout Team." So, to make this interactive, and to give us some actual content, please post your own Ron Zook "Facts" in the comments. The man is a recruiting legend, let the legend be told in song and story. For all the ridicule that we give to the Big Ten Network's production values, commentators, and availability, they managed to do something no other network has done before: Show the Michigan Marching Band's pregame. It's rare to see a pregame video from the angles they show, and certainly not broadcast to a television audience (at a home game at least). This is probably only happening because they haven't sold enough commercial time to fill the gaps, but meanwhile, I applaud their coverage. Unfortunately, the national DirecTV attention came at a bad moment. About that: A miscommunication caused the block M fold-out to begin early in some portions of the M. Less than two seconds later, they recovered in time to begin the M Fanfare right on cue and continue pregame without missing a beat. Cody erased all doubts that it phased the band as he caught his goalpost toss and the backbend was the best it's ever been. Kudos to the BTN for showcasing an excellent pregame Enjoy the close-ups of bandsmen breathing heavily in the middle of what is essentially a seven-minute sprint in a wool uniform! Enjoy the field microphones' horribly unbalanced audio! And stare with amazement as they actually continue to play their instruments during the lock-step! I edited the beginning out, because I can. The full version is available at mgovideo. Meanwhile, thanks, BTN! Go Blue and Go Bid! Just a quick heads up note to alert out loyal readership that the Bernard "Pat" Maloy Scholarship Online Auction is NOW OPEN! The proceeds are going to the Maloy Scholarship Fund in order to support a scholarship for an undergraduate Kinesiology student who has been touched by cancer. There is a LOT of great Michigan stuff in there, and bidding for a good cause somehow makes it easier. Plenty of time left to bid, but seriously go look around, because there's some really great stuff over there, including some stuff I don't want to specifically mention because I am bidding on it and that is just bad auction strategy. So maybe you're a little down that the Sweatervest and his ilk are right back at the top of the BCS rankings this year despite their losses on both sides of the ball. Well, you shouldn't be, but it might be happening. With that in mind, HSR Correspondent Dave checks in with three best case scenarios for the remaining games on Michigan schedule this season. I have to say, they warmed my cockles. 1) 9-2 Michigan beats 11-0 aOSU, knocks aOSU out of the MNC and the Rose Bowl. Mike Hart runs for 250 yards in the game. Off to the Rose Bowl, where they gut out a rematch victory over Oregon while overcoming the Heisman curse. Coach Carr retires and _____ (insert your favorite candidate here) is quickly hired for the 2008 season. 2) Michigan stumbles down the stretch and is 7-4 or 6-5 going into the big game, but manages to beat aOSU. The Alamo Bowl never felt so good. Meanwhile, aOSU goes to the Rose Bowl, where they lose 40-7 to Oregon. 3) Michigan loses to AP #1 aOSU, but, when the final BCS standings are announced, it's AP #2 Boston College v. AP #3 Arizona State for the MNC. (Replace one of those teams with South Florida if you like. But not Kansas or Hawai'i.) Jerry Palm runs the computers, goes on ESPN, and says that if Michigan hadn't lost to Appalachian State, aOSU's strength of schedule would have been enough to make the MNC. "The horror" is suddenly transformed into "the irony." We taunt aOSU fans by saying we planned it all along. Craig: Good evening ladies and gentlemen and welcome to WTI: Glass half full edition. We're halfway through the season, and one thing is clear, we're well stocked up on crazy. Geoff: Dogs and cats, living together. Mass hysteria! Craig: It just scares me how much the "unpleasantness" seems like it was from another season. Geoff: That there's even debate on "greatest upset in college football history" this year is an undeniable comfort. Craig: Which is bad and good...And the Stanford win this past weekend did prove the biggest negative of it: Anytime a major upset occurs, the unpleasantness will be used as a measuring stick. Craig: The difference is, I wasn't ready to remove someone's eye when it was mentioned. Four wins in a row will make you much happier. Craig: But let us be clear, this is a flawed team. 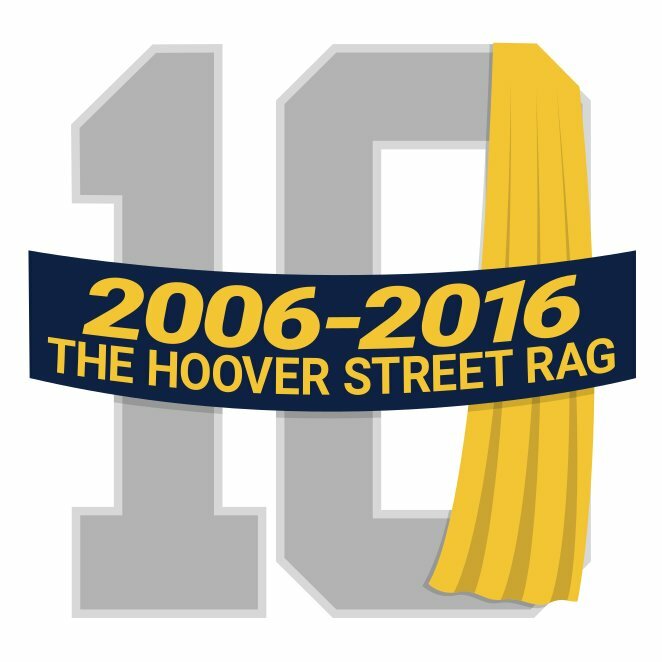 So issue #1: If we agree that the best thing about this team is Mike Hart, what is the most disappointing aspect of the 2007 Wolverines? Geoff: The defense as a whole, I'd have to say. Craig: See, amazingly, to me, it's the special teams. Because the defense, while disappointing, has looked better in recent weeks, albeit against more conventional attacks or lesser talent running "crazy" schemes. But the special teams with their bend to the point of actually breaking philosophy have just been driving me mad. No reliable kicker, poor coverage on all aspects of kicking, and while I know you don't always get a Steve Breaston, no even threat to break one on a return. It's just madness! Craig: Especially when you look at Beamerball and realize that you can win a lot of games, or at the very least, stay close in a lot of games, with exceptional special teams play. Geoff: The kick returns have been incredibly frustrating to watch, especially what we saw against Eastern. Craig: Seriously, I was watching the Eastern game and thinking "You know, I thought the unpleasantness was humiliating, but if we lose to Eastern, I KNOW PEOPLE WHO WENT THERE! We'd never hear the end of it!" Geoff: They absolutely gave up contain on the 86-yarder that should have been stopped before the 40 no matter what. Then the next time Eastern received the kick, they did the same thing, except the runner decided to go up the sideline instead of cutting back. Geoff: For the defense, we knew the linebacking corps and the defensive line lost two NFL players each, but the cupboard wasn't exactly bare with the D line and we thought the linebackers might be of some use in run support. And we'd had much better results against spread offenses, so the regression was horrifying to watch. Craig: OK, let us get back to the positives. What has been your most pleasant surprise of the season? Geoff: Donovan Warren's tackling is up there. He's not a great corner, but he's been adequate, which is more than you can expect from a true freshman, and he's done well to stick the tackles he's had to make. He's already better than Grant Mason. Craig: Agreed. Donovan Warren may not be Marlin Jackson or Charles Woodson as a freshman, but he is giving me hope in the defensive backfield. Geoff: My other surprise has been the Space Emperor, actually. Zoltan has been remarkably good week in and week out. No more alternating 60-yard line drives with 38-yarders, his nuclear death bombs have been pinning his enemies inside their own 20 on a regular basis. Craig: If only he understood corners, but I don't know if anyone teaches that any more. Geoff: There are no corners in space. Geoff: What surprises have you seen? Craig: Mine has been Adrian Arrington and Greg Matthews. With Manningham not being Manningham this year, I feel that Arrington has moved from possession receiver to multispatial threat, and that Matthews has become a mini-Avant. Geoff: They've been exceptional, especially coming across the middle. Craig: OK, Issue #3: Les Miles, have we turned a corner? Craig: Let me preface this by saying two things: 1). I was opposed to Miles during the summer for fear of hiring a crazy man. 2). I still think I'd rather have Brian Kelly for reasons stated this week. Geoff: After watching that monster of a game between LSU and Florida this weekend, I can't deny it any longer. If he's available, I want Miles. He's still a crazy man who'll probably say some dumb things, but he can coach. Craig: In watching the game this past Saturday, I think I had the same reaction as you: I'd rather have a coach who costs us a game here or there by rolling the dice and playing to win the game at all times than a coach who would rather get into a shell and hope you can defend the fort. Jeremy: I think the real loser in the Brian Kelly situation here is Michigan State, and that's fine with me. Geoff: I like Brian Kelly. If Miles and Tedford don't want the job, he's my #3 choice, but he's a risk. Craig: The risk being, he's an unproven commodity at the bigtime level. Geoff: Right. Miles and Tedford are known quantities, to some extent. Maybe not at Michigan, but they're at major programs and each has taken a bottom feeder up to respectability. Craig: But these are just the idle musings of Michigan fans. Craig: Issue #4: Michigan has six regular season games left. Do I have anyone bold enough to predict four more wins? Geoff: Tough call. Any other year and I say "Hell, yes!". Craig: But this is the year of infinite confusion. Geoff: I think we can do it, but it'll be a rough road. Jeremy: I'd take four as an absolute maximum. Wisconsin and MSU are both overrated, and we have the ridiculous-season and nothing-to-lose factor in our favor vs. OSU. Geoff: The optimist says we get Purdue, MSU, Minnesota, Wisconsin and lose to tOSU to inflict maximum pain on ourselves. Illinois runs a crazy spread, and this game will make them give Ron Zook a 10-year extension. Craig: Minnesota, on paper, looks like a gimme, but we know about the games on paper theory. Illinois looks amazing right now, but they are still prone to the Zookian collapse. Purdue might run our defense off the field. Michigan State looks to be in another trademark Sparty swoon, but that's when they are most dangerous. You'd never want to see Wisconsin at home, even if Michigan has never lost two games in a row there. And ever since the Sweatervest showed up, I can no longer feel good about any tOSU game. Geoff: I would trade an 8-4 season for a 6-6 where we beat OSU. Jeremy: Absolutely. That's what it's come to. Craig: Wait, I'd rather beat State than Ohio State. Geoff: You have more Spartans at work than I do. I have as many Boilermakers as Spartans. Craig: Yes I do. I know far too many Spartans. Geoff: Spartans are brain-addled. They have no long-term memory. Craig: Yes, but that could be a survival mechanism. Craig: Issue 5, the last of the night: What are you most looking forward to in the last six weeks of the season? Geoff: Just watching Mike Hart. Jeremy: He sets a record every time he touches the ball now! Geoff: And he can't come back next year, so you better take joy in his 4 yards out of nothing while you can. Craig: Sub-issue 5: Can Mike Hart get an invitation to New York in December? It seems like there is no front runner at the moment, and while i know that winning will keep him at the forefront of the discussion, can he earn his way to the Yale Club? Geoff: If he stays healthy, I think he finishes third in the Heisman balloting. Jeremy: If he's not in the top 3, the whole system is rendered fraudulent. Geoff: If he stays healthy and Michigan inexplicably/impossibly fights its way into the Capital One Bowl or above and he pulls a Biakabatuka vs. tOSU, then things get interesting. Craig: I like your line of thinking Geoff, and I wish to subscribe to your newsletter. Wait, I do. Craig: Homecoming this week, so it's a traditional show, no? Jeremy: Glenn Miller + the 50th anniversary of "Hawaiian War Chant". Craig: Before it was a state, it was a war chant. Craig: All right, that's it for this week's edition of WTI. Thank you for reading, and Go Blue. It's sort of a strange feeling for me, because I don't think I've ever been in a position to play the coaching wish list game. Bo lead to Moeller and Moeller's night out lead to Coach Carr and while I knew that Coach Carr would likely leave on his own terms, provided he didn't have a penchant for coffee and Grand Marnier, I did not suspect that I would start thinking about whom I would like to be Michigan's head football coach. Then the unpleasantness occurred. And then the rumors swirled about this being Coach Carr's final season got louder and louder. And while Michigan was pulling itself up off the mat, I began to think about whom I would like to see coaching Michigan in the future. I saw the lists of candidates that people had developed, read pros and cons, and just wondered what I really wanted in a coach. But I've pretty much known from Day 1 whom I want to be Michigan's next coach. It's a lot of faith, perhaps misplaced, but in my mind, it makes sense. Brian Kelly, from what we have seen in his record, takes what may not be the best talent, and finds a way to win. He never had a losing record in Allendale, won five GLIAC championships, and made six NCAA playoff appearances in 13 seasons. He won two D-II national championships at Grand Valley State, he went 118-35-2, a winning percentage to rival that of…Coach Carr. But Craig, that's Division II, that's not the Big Time! Well, OK, perhaps, but consider that Brian Kelly was recruiting out of the same pool as his competition and was not working with a "name" until very late in his GVSU tenure, he clearly was maximizing the talent he got. So he moved on to Central Michigan to replace Mike DeBord as the Chips' head coach, and it wasn't exactly smooth sailing, but Kelly took a scandal rife Central program from 4-7 to 6-5 to 9-4 in just three seasons. His four losses last season were to Boston College, Michigan, Kentucky, and Northern Illinois, all teams that went to bowl games, and the latter three on the road. The loss to BC was just a touchdown margin. Kelly's turnaround in Mount Pleasant got many around the country fired up, he was the rumored lead candidate for Iowa State and Michigan State, but ended up taking over Cincinnati when Mark Dantonio left for EL. He immediately took over the Bearcats, coaching them in their bowl game when Dantonio took his entire staff to Michigan State, and he beat Western Michigan for the second time in a season. Now he's got the Bearcats rolling to a 6-0 start after Saturday's win at Rutgers. He seems to have Cincy's offense clicking on all cylinders and the defense hasn't allowed more than 23 points this season. He seems to be somewhat low profile in the sense of he doesn't seem to provide much in the way of bulletin board material or headlines. He seems to want to focus on his team and he has a pretty solid track record of handling discipline issues in a swift, fair, and efficient manner. I'm probably verging into coaching mancrush territory here, because I really don't know that I see the downsides. I suppose we don't really know how good a recruiter he is, we don't know how well he would handle the pressure of being "the man" at a place like Michigan, and we don't know if he can't beat the upper echelon Big East teams like West Virginia or South Florida (wow, that felt weird to type). But it just seems like a guy who knows Michigan as a state, a younger guy who runs an entertaining offense (Kelly is only 46, it would make it easier for him to be a long term solution), and a guy who has a proven track record for winning wherever he's gone seems like a good candidate for Michigan. The fact that he would likely be cheaper than Les Miles or Jeff Tedford and the fact that he might be a more likely candidate to move up to Michigan than Tedford or Miles just seems to make him the better choice in my mind. I know there are a lot of factors to consider when looking for Michigan's next head coach when the time comes, and I know that there will be a lot of factors that the average fan is not privy to, but I genuinely believe that Brian Kelly would be a great candidate for Michigan's next head coach. Until then, good luck Bearcats! Michigan welcomes back a few MMB alumni at the Eastern game this weekend. Miller Asbill and John Zastoupil both served on last year's MMB staff while earning doctoral and master's degrees, respectively. Professor Asbill is Eastern's Director of University Bands, and Professor Zastoupil is the new Associate Director of Bands and the Director of the EMU Marching Band. Ohio State: Dr. Jon Woods, 23-year director of "Tibbid Bittle," holds a Ph.D. from the University of Michigan. Penn State: Dr. O. Richard Bundy, director of the Blue Band, holds a Master of Music degree from the University of Michigan. Michigan State: Kevin Sedatole, Director of Bands, served as the Michigan Marching Band director in the late '90s. Wisconsin: Bill Garvey, field assistant to the University of Wisconsin Marching Band, holds a Master of Music degree from the University of Michigan. Minnesota: Director of Bands Jerry Luckhardt served on the University of Michigan faculty. Texas: Assistant (to the) Director of Bands at Texas, Dr. Damon Talley, holds a Master of Music degree from the University of Michigan. There are undoubtedly more out there, but even this list provides further incontrovertible proof of our dominance over mankind's accomplishments, from marching bands to lunar travel. We're in ur faculteez, correcting ur step sizez. So, to set this up, it's Homecoming spirit week at the high school where I work and Tuesday was "Super Hero Day" where you either took up the guise of a real super hero or made one up for yourself. So when one of my colleagues told me she was coming as the Spartan Avenger and wanted to know if I would partner up with her as a Michigan super hero, so I jumped at the chance. Here now, the profile of "Michigan Man" (note: Wolverine was already taken.) Michigan Man Alias: Victor Valiant Super Powers: Breaking tackles, leadership, a sense of history, conquering the West... Known Weaknesses: Spread offenses, mobile quarterbacks, Division I-AA Opponents...[ugh.....] Arch-Nemesis:The Sweatervest Other Known Enemies: Captain Comeback, The Genius of South Bend, The Humanitarian That's all I really had. Dumb, but I hope you chuckled. 6:15 is a damn early Saturday wakeup call in any timezone, but I'd been the one pushing for a 7:00 departure from the O'Hare Holiday Inn, so it was all my fault. We made Evanston, figured out you can't park on the golf course, and found the on-campus lots by 8:00. Immediately after we parked, in came a U-Haul next to us. Three people in Michigan gear jumped out of the cab and rolled up the gate. 15 guys inside gave a cheer and jumped out the back. Awesome. We got ourselves set up quickly and looked around our lot. Nothing but Michigan fans as far as the eye could see. Blue sky, blue lake, yellow sun. The U-Haul people got out the grill, the boombox, and the traditional door for flipcup. Craig caught up on the sleep I'd deprived him of while the rest of us threw the football around [Craig: I want to make this very clear, that is sleep, not drunk. Sleep!]. My brother and I are always apt to wander when tailgating. The Cardinal came with us as we tried to find a way down to the beach, but it's all fenced off. Lame. I was at least able to get this picture looking back toward our tailgate site. You can see the Grosse Point lighthouse sticking up on the right. If the spelling of "Grosse Point" looks wrong, it's because the "e" in "Pointe" had to be amputated after a particularly chilly February in 1917. At 10:00 we packed up and then started walking to the stadium. The other three headed inside while I waited to give my sister her tickets. And waited. And waited. At the exact moment when I was about to snap, her cab pulled up. I pitched the tickets through the open window and ran to my gate. I took my seat as the NUMB was lining up for pregame. The first thing you notice is that Northwestern has a very small band. Its total undergrad enrollment is 7,826, so that makes sense, but 148 is still not a large number. They also have flutes, and a lot of them. Not just piccolos, but flutes, which are even harder to hear. The performance was pretty good, and both drum majors nailed the backbend, but then they interrupted it in the middle for five minutes of standing around doing nothing while waiting for the team to come out of the locker room, during which time the PA system – the PA system! – played "Thunderstruck" and "Welcome to the Jungle". And the team didn't exactly race down the hill either, it was more of a casual jog. Decidedly anti-climactic. The band played the anthem and then finished up their show with some other Northwesterly things before vacating the field. We had a prime view of Northwestern's first play of scrimmage and Brandon Harrison's galling failure to get Omar Conteh down. I kept waiting for the whistle after forward progress had been stopped, but it never came, just like any help. I think everyone thought he was down and nobody wanted to risk a 15-yard personal foul on the play. The referees were just terrible. In the end, I think 4 plays were stopped for further review in the booth plus the one challenge from Lloyd. That's way too many, in addition to the crap late hit call (which was a direct result of the busted first play). I want to see Brian's UFR for our defense. There was a point where Northwestern ran the same sweep to the left three times in a row for 10+ yards on each carry. Then there was the hideous breakdown where the Wildcats ran Omar Conte on TGDCounter-Draw for the long touchdown run. It seemed like it took forever for us to get real pressure to Bacher. He had a lot of time to hang around in the first half, and even in the second there were key plays where we gave him 6 seconds in the pocket without a guy in his face. Once we started to get to him, I think that's what forced those (oh so sugary sweet) interceptions. Speaking of which, there is no joy like that of seeing a defensive lineman chugging down the sideline with a tipped ball in his hands. Godspeed, Tim Jamison, even if Mike DeBord ran his patented "zone left, zone left, throw out of bounds" offense immediately thereafter. Seriously, no man can take the air out of a stadium quite like DeBord. Zone left was the call after every turnover we recovered. Do we have another right guard on scholarship available after Zirbel? I think the position might be cursed. I need an old priest and a young priest. Never ever trust a kicker who went to Detroit Catholic Central. Especially a walk-on. How bad are our other kickers if they can't take that job? Every drive in the red zone is now 4-down territory. The NUMB's halftime show? West Side Story. If EMU's band does it next week, Hollywood may have company, as all band directors will be officially out of ideas. My brother and I were there for the '95 Northwestern game, and I was at Michigan Stadium for the '96 one. It looked pretty dark at halftime. On the one hand, we played a brutal first half where we couldn't tackle a throw-pillow. On the other, it's a hell of a thing to be in a hostile environment different stadium and watch your team claw its way back to the tune of 21 unanswered points as Mike Hart passes Jamie Morris on the all-time list and Chad Henne sets the school record for career TDs. We were in Section 104, Row 20. In front of us were a dad and his two kids, behind us were a bunch of guys in their late 20's, and all of them were a ton of fun to be around. HIGH FIVES FOR EVERYONE. We went to Indiana last year and Evanston was our road trip for this year. 2-0! Next year: Minnesota, probably. The Metrodome is a crap environment for college football, but I'd like to see a game there before that's not an option. Purdue is another possibility, especially since West Lafayette is a relatively quick drive for me. Other photos from gameday can be found here and here. And, hey, this is our 150th post and our 100th of 2007!